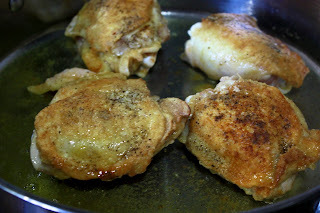 My fiance Josh often misses the motherland (El Salvador), he also misses his Mother, and her great cooking. 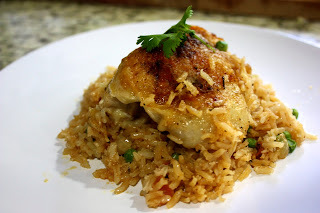 There is a difference between the kinds of Mexican foods we cook at home, and the kinds of dishes that Josh grew up eating in El Salvador and Florida, so I know that he craves different dishes I don't cook often. 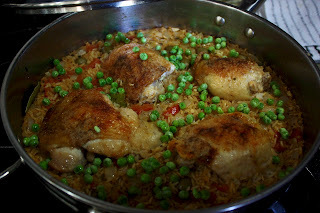 Tonight he was missing a latin staple, Arroz Con Pollo. 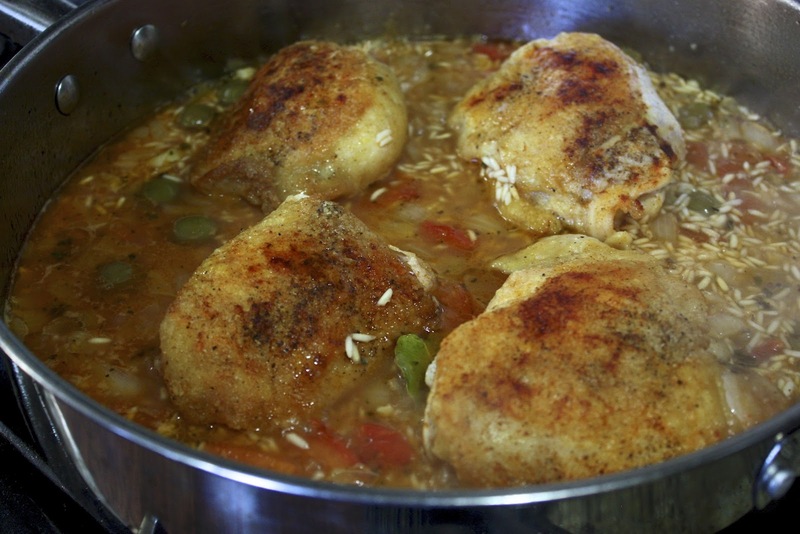 This dish is one of those staples that every latin family makes, and they each have their own recipe and technique. You can add whatever ingredients you have on hand, but in our case, we added ingredients Josh remembers his Mom adding. 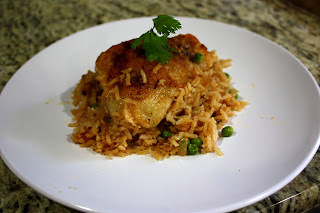 Its one of those one pot dishes, which makes for easy clean-up, easy serving and easy to store left overs! 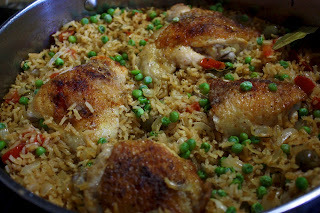 I wish that I could take the credit for this one, but I acted as photographer and occasional pot-stirrer for this one, Josh made this dish on this own! Heat 3 Tbsp olive oil in a large oven safe skillet or dutch oven, that has a cover, on medium high heat. 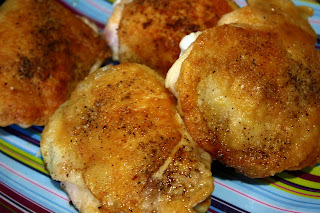 Put the flour in a bowl, mix in a generous sprinkling of salt, pepper, and paprika. 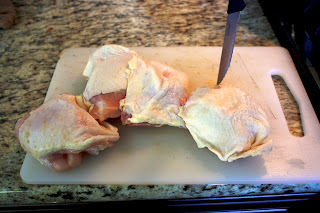 Also season chicken pieces directly with salt, pepper and paprika. 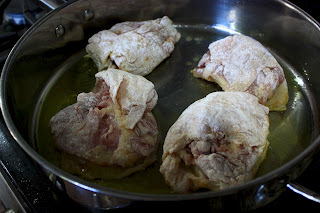 Dredge the chicken pieces lightly in the flour mixture and put in the pan to brown. Cook a few minutes on each side, just enough so that the chicken has browned. Use tongs to remove from pan and set aside. 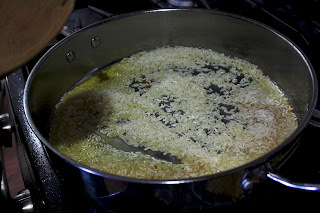 Add the rice to the pan to brown. 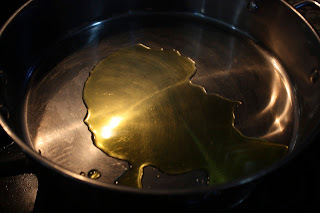 Add a little more olive oil if necessary. Stir first to coat the rice with the olive oil in the pan. Let it brown slightly. Then add the onion, bell pepper, tomato, bay leaves, and garlic. 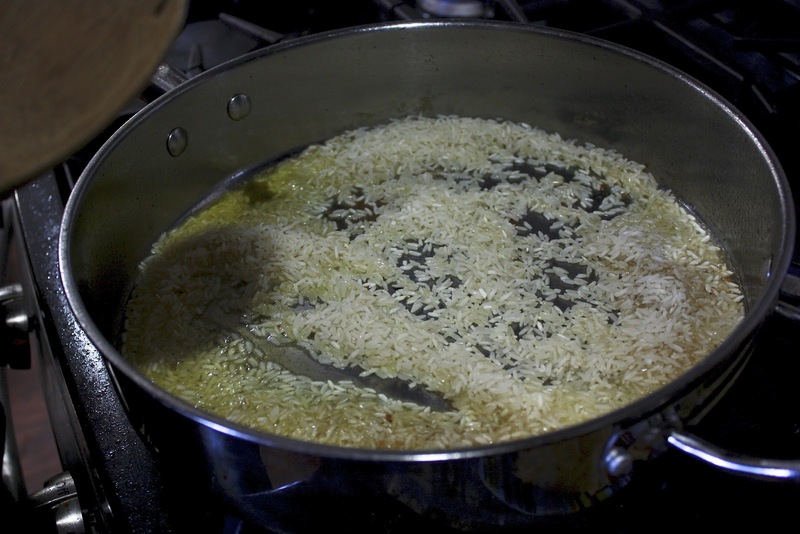 Cook the mixture, stirring frequently, until the onions have softened, about 4 minutes. 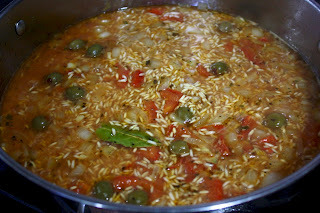 In a separate bowl, mix together the stock, tomato, salt, and oregano. Pour the stock mixture over the rice and add the olives. 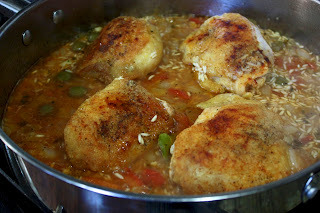 Bring to a simmer, reduce the heat to low, then Place the chicken pieces, skin-side up, on top of the rice and cover. Let cook for 20 minutes, then add peas. Cook for another 10-15 minutes depending on the doneness of the rice and fluff the rice with a fork. Serve with chopped fresh cilantro as a garnish, or top with fresh pico de gallo.